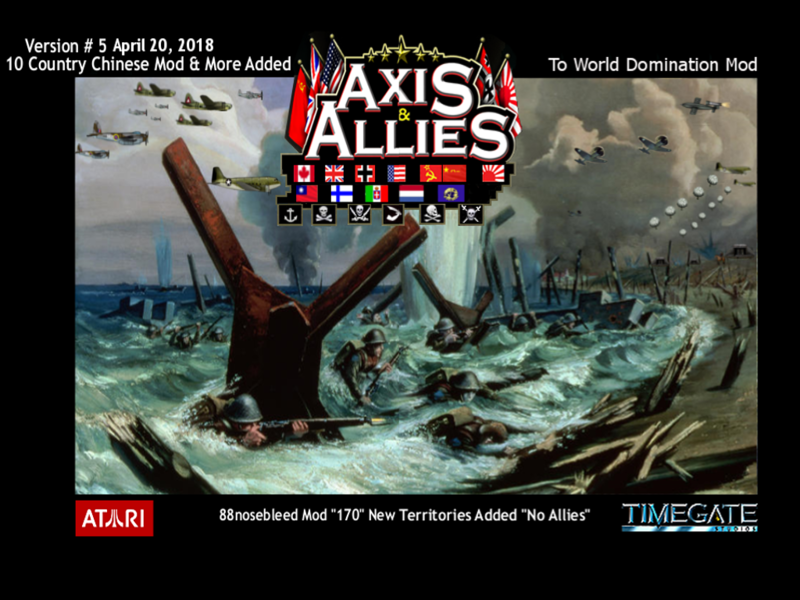 Friday April 20,2018 Axis & Allies RTS 10 Country Chinese Mod Version 5 Special thanks to theharkonnen for his tutorial on making new additional territories in WWII. It opened the doors in many ways for me. I want to thank Wordsarecool for his great work on Starship Troopers: The Homefront Campaign and allowing me to modify it and incorporate it into this mod. I have added my 41 new territories. So we will have a Grand Total of 170 new additional territories to conquer in WWII. Add the 55 original territories which still exist on the map and that comes to 225 Total territories. Yes the world is very large. This is why I gave some the WWII armies a movement of 2 to allow you to maneuver about the map a little more rapidly. It also helps by being able to capture enemy unreliable infantry armies for they can move right after the battle in which they are captured. I want to thank Wordsarecool for his great work on Starship Troopers: The Homefront Campaign and allowing me to modify it and incorporate it into this mod. Yes, some of the territories have very ferocious bugs that multiply rapidly, heal quickly, can come from many directions and are full of surprises, see if you can get them out. You will also find that Mobile Infantry Roughnecks have taken over several territories and they don't give up easily. End of briefing, You have been warned. You will still need the Forgotten Combatants Skin files if you have already downloaded it you will be fine. Simply install the A&A folder in My Documents, Re-name any other A&A folders that may be there. In the WWII mode, I play as German and purchase all the technologies. But I could not find a techonology call "Battleships", and in the infantry corps there are whole bunch of units not deployable at all. Is there anyway to solve this? Those units you see are deployed from naval units, when you have purchased a Battleship or when you enter territories that contain water and have naval units deployed you get the Battleship tech automatically. That just means that they can connect to those HQ's for supply. excuse me good man how to ptu mods? ?